One of the largest dam dismantlement projects in history saw the Elwha and Glines Canyon Dams come down. The Elwha River near its source waters in Olympic National Park in the U.S. state of Washington. In September of 2011, tribes everywhere cheered in rapture as the first of the concrete came crumbling down and the river, finally freed, roared past to the Strait of Juan de Fuca, starting the largest dam removal project in the history of the United States. Already the affects are evident as salmon returns to the Olympic National Park by way of the Elwha River for the first time in over a century. Its source being the "Elwha Snowfinger", a narrow gully between Mount Barnes and Mount Queets, deep in the Olympic Range within Olympic National Park, the Elwha River runs for 45 miles north to the Strait of Juan de Fuca, draining a fairly large area of the northern half of the mountains. 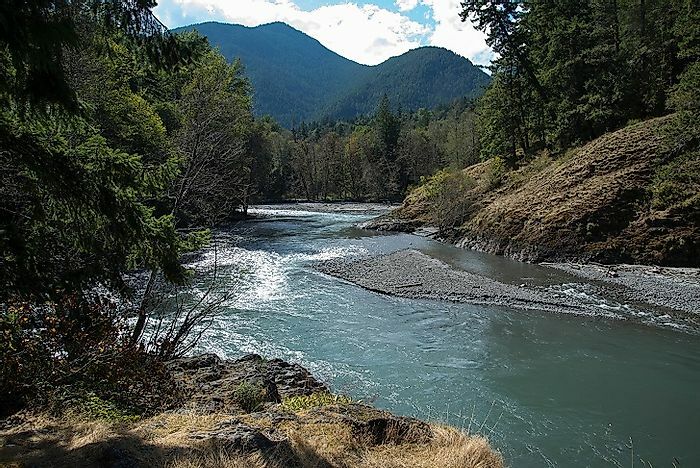 The Elwha is the only river in the northern half of the Olympics that has ever been dammed, and since the dam removals, the state’s newest beach has formed on the coast from sediment locked up behind the dams now being discharged into the sea. The Elwha was a main anchor river for the Lower Elwha Klallam peoples, groups that lived along the river in several villages. Like many other tribes during the 19th Century, their populations were devastated by diseases carried by Europeans arriving to the area. Towards the end of the 19th Century, the growing region, and nation as a whole, looked to the Pacific Northwest for timber for growing cities. In the early 20th Century, Thomas Aldwell first saw the river gorges at the edge of the mountains and saw hydro-power galore for nearby timber mills. With financial backing from Chicago-based investors, he built the Elwha Dam (the lower one) in 1910, which became operational in 1913. Thereafter, the Glines Dam (the upper) was completed in 1927. However, being early dams, the builders lacked the concern to build fish ladders for spawning salmon, and so the ecosystem suffered. But in the 1980s, people, especially the Elwha Klallam tribes, began to question there being dams inside the Olympic National Park, which was established 1938, and so in 1992 the fate of the dams were sealed in the Elwha River Ecosystem and Fisheries Restoration Act, with the first dam, the Elwha, being completely removed in 2012, followed by the Glines in 2014. Presently, with the dams removed, replanting efforts have been underway to fill the exposed beds of the previous lakes, and rafting has become popular on the river. Additionally, a Washington State ferry is named the "Elwha", and is one of only two state ferries in the fleet permitted to sail internationally to Vancouver Island. The river is one of the few in the region where all five native salmon species return and spawn, and since the removal of the dams the Chinook redd (migratory spawning nests)count alone has risen 350 percent, with 32,000 outgoing Coho salmon fry counted in 2014. Even when the dams were in place, the river was still home to all of the native salmon species, along with steelhead trout, beavers, elk, dippers, eagles, beavers, with hermit crabs, starfish, and Dungeness crab. However, since the removal of the dams, their habitats, especially the fish populations, have greatly expanded, while many creatures that feed on fish are now enjoying the meals further into the mountains and/or are moving further up the river themselves. Currently, the only potential environmental threats to the river are either aggressively environmentally disruptive corporations building a new dam, or logging companies illegally harvesting timber within the national park along the river. The Elwha, being located entirely inside Washington state, is experiencing no notable territorial disputes at the present time.